This is a great recipe for the coming holidays. It uses Robbie’s Gourmet Sausage Company‘s Apple Butter and Sage Sausages. 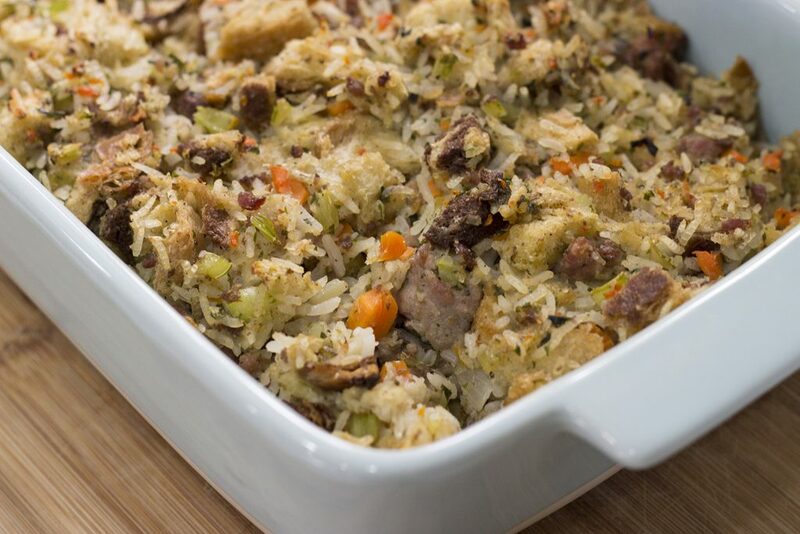 It’s like fall in a sausage and it works really well in this stuffing. Robbie will have the shop will be open this weekend, Saturday and Sunday from 10am-3pm. This, og course gives you plenty of time to stock up at the saucisserie. If you don’t have the opportunity to use the Apple Butter and Sage sausages try experimenting with your favourite links. Preheat the oven to 350F. In a large bowl, add the cubed bread, garlic oil, parsley and oregano and mix until the bread is coated. Spread the bread out evenly onto a baking sheet and place in the oven for about 20 – 30 minutes. Turn the oven off but leave the bread inside. This can be done a couple days in advance. I just let them hangout in the oven to ensure the bread is completely dried out. If the bread is not properly dried out, the stuffing becomes mushy. Remove the sausage links from the casing. In a pan, over medium to low heat, add 2 tablespoons of olive oil. Sauté the sausage in the pan, breaking it up as it cooks. I like big chunks of sausage in my stuffing but it’s entirely up to you as to how ground up you like it. You do not want to overcook the sausage as you’ll be cooking it further in the oven a little later on. Place into a large bowl and set aside. In the same pan you’ve cooked the sausage, add 1 tablespoon of butter and add the carrots, onions and celery. Again, you do not want to overcook the vegetables. I take it off the stovetop when the onions have become a bit transluscent but the celery still has a bit of a crunch to it. When cooked add to the bowl with the sausage, along with the cooked rice and cubed bread. Just a tip: everything up to this point can be done a day in advance and stored separately in the refrigerator until you need it. Add chicken broth. Thoroughly mix everything together and place into a pot. Cook over low heat until the chicken broth has been absorbed, about 5 minutes. Add salt and pepper to taste. Add the stuffing to a 8×10 baking dish. Place in the oven at 350F, uncovered and bake for 60 minutes. Tags: Recipes Thanksgiving	recipes Robbie's Gourmet Sausage Co.